In keeping with its focus on delivering only the highest quality user-driven home audio-visual technology, in products that are both sleek and simplistic in design, Samsung has announced the release of the new MS750 Soundbar. “Samsung has over ten consecutive years of market leadership in home audio and video technology and we always strive to deliver more. 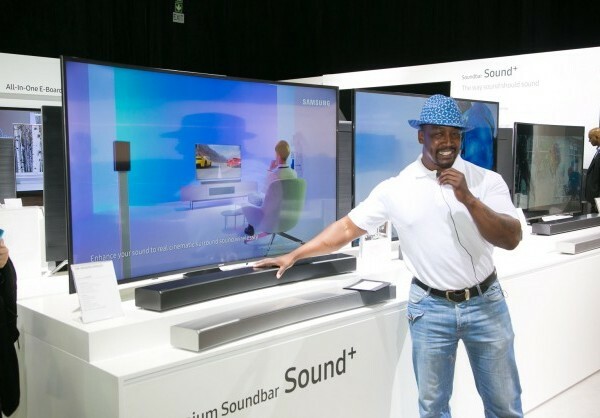 In this case, the MS750 Soundbar supplies a crisp and immersive sound, wherever you are in your home,” says Lance Shaun Berger, Business Unit Head: TV/AV at Samsung South Africa. Making use of Samsung’s Proprietary UHQ 32bit Audio Technology and the company’s own audio algorithms to expel perfect ultra-high quality sound, the MS750 Soundbar is able to deliver rich audio that brings each note to life with incredible clarity, providing a powerful home cinema experience. The deeper sense of immersion delivered by the MS750 Soundbar is a result of superior up-firing capabilities and overhead sound that uses vertical tweeters with upmixing technology. When paired with the Samsung Smart Remote Control, the room’s home audio is powered by the same device as the TV, further simplifying the home entertainment experience. “The device’s small but robust ‘one body’ means that it can be mounted onto your TV with a single connection; there is no complicated setup and no extra space required,” Berger adds. In addition, this means that the soundbar and TV can be turned on at the same time. Simply connect the two units with a designated power cable connection, eliminating the need for two separate power cables. It is the answer to that clutter around the TV. The wall-mount solution on Samsung’s newest home audio systems has also been improved, with an optional, user-friendly I-shaped bracket connecting the TV directly to the soundbar. This approach simplifies the mounting experience entirely as it requires only one connection to install it to the TV and one hole in the wall. The MS750 Soundbar is a perfect accompaniment to your audio-visual entertainment system at home. Not only does it simplify the setup, with less cables and connections, but it also includes the benefit of exceptional sound quality of the highest standard, and ensures a sound experience like no other. And, to boot, it is a beautiful piece of technology, which will seamlessly fit into your living space and enhance the overall look. “The MS750 Soundbar is designed for the listener that wants a single, simple solution that not only fits their lifestyle, but that simultaneously delivers an unparalleled home audio experience,” concludes Berger.